British Literature Broad Notes Novel Discuss the use of Symbolism in Golding's Novel, "Lord of the Flies"
Discuss the use of Symbolism in Golding's Novel, "Lord of the Flies"
Generally, symbolism is an object representing another to give it an entirely different meaning that is much deeper and more significant. 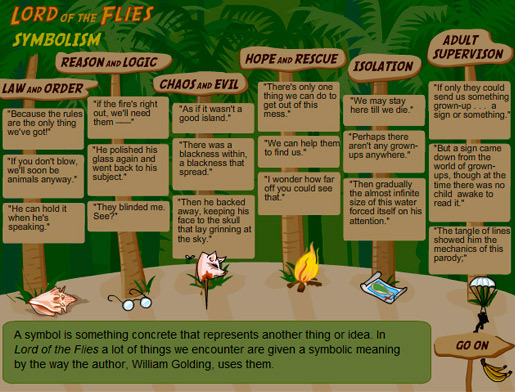 Lord of the Flies is an ingenious work of literature in which the author, William Golding, explores the issues of civilization and savagery. Throughout the novel, the author hides powerful messages in some very unlikely places, and Golding's use of this literary technique - symbolism - is the subject of this essay. One of the most important symbols in Lord of the Flies is the “conch” shell. The conch symbolizes democracy, law and order, authority, civilized behavior. It brings peace to the group of boys. It is the only item in the island that makes them united and keeps them civilized. Finally the conch shattered to thousand fragments when Roger releases the rock from above, killing piggy. The destruction of the conch symbolizes the end of civilized behavior and the beginning of autocracy, despotism and barbarism. Piggy’s glasses also carry symbolic significance. They symbolize knowledge, logic, intellect and science. Without them the boys would have never able to have fire. They are also lense or window through which goodness and evilness can be scanned. Piggy uses his glasses not only to see, but also to discern what is right, wrong, safe or harmful. When Piggy loses his spectacles, he also loses his clear vision and power of discernment. Fire also symbolizes survival and destruction, life and death. Fire is first used to try to attract a passing ship which would take the boys back to civilization. The flame also symbolises hope. The boys keep the signal burning and their hopes alive. However, as the fire grows dim, it reflects the attitude of the boys and their loss of morale. At the end it becomes the symbol of rescue as the boys are rescued from the island. The Beast devised by the boys is imaginary, symbolizing the savage instinct within the hearts of all people. When the boys reach the climax of their savagery they begin worshipping the Beast and attributing inhuman qualities. The idea of the Beast can also be understood as propaganda used by Jack to attain a totalitarian government. The Beast, or The Lord of the Flies, (from which the novel's title is taken), represents the devil, Beelzebub. The devil is the source of all evil. The island itself serves a dual purpose; it is the symbol of hell as well as paradise. The island itself is a microcosm of planet Earth, alone in a vast surrounding universe with the capacity to sustain humanity, but also prone to destructive storms. Early in the story Ralph and his companions finds a certain glamour and enchantment on the island which is symbolic of Garden of Eden. In the last chapter, the whole island is turned into a blazing inferno which symbolizes hell. The painted faces of Jack and his “tribe” symbolize man’s return to primitivism and barbarism. All the characters possess their symbolic value. Ralph symbolizes civilization and order. He shows the sophisticated side of man and holds the position of a democratic leader. Piggy represents the voice of reason in civilization. Clearly Simon is the Christ- figure, the voice of revelation. Jack and Roger symbolize evil. Jack shows the power-hungry and savage end of society while Roger represents brutality and bloodlust. The littluns represent the common people. The introduction of the dead parachutist symbolizes the fall of adult supervision. It also symbolizes the start of destruction. The appearance of the naval officer symbolizes the return of both adult supervision and civilization. Golding with his superb brilliance has crafted the symbols in this novel to relate the gruesome picture of the post-World II human generation. These symbols help to convey the author’s message about human nature, with its contrasting poles of kindness and rationality and power and bloodlust. 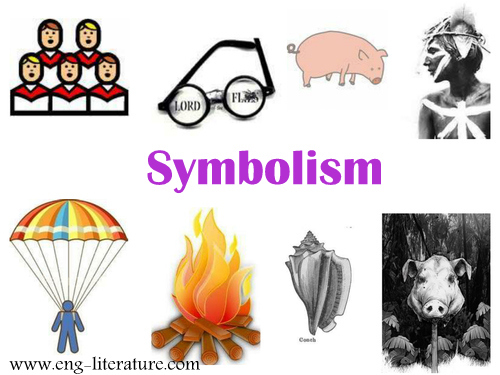 Well-written and meaningful, Lord of the Flies uses symbols to reinforce its telling of the tale of humanity.